Every time we dine at a Chinese Restaurant, sweet and sour pork is always present in the menu and also always present whenever we order. The combination of sweet and sour taste makes this viand popular. I must admit, I already forgot where we eat when I took this photo. Maybe at Noodle Park or in Savory Restaurant. That looks sumptuous. Drooling here. I like this version of sweet and pork, it is so saucy! 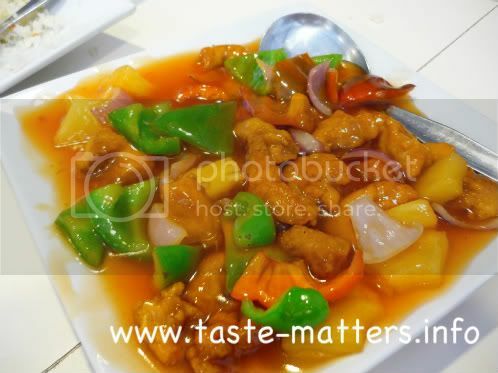 yummy.. ito lagi ko order sa restaurant bahh... lamia kaayo tan awon oi..
we have a family anecdote about sweet & sour pork. :p probably the reason why i seldom order or cook it. I haven't tried Savory restaurant. Are they really that good? oh thats interesting... ano yun? care to share? i love sweet and sour dishes! yours look yummy sis! thanks for the visit! returning the visit via ftf! ayay! kalami...murag kuwang rani nako...ehehhehe! fave nako ang broccoli beef ug chow mein sa chinese resto.